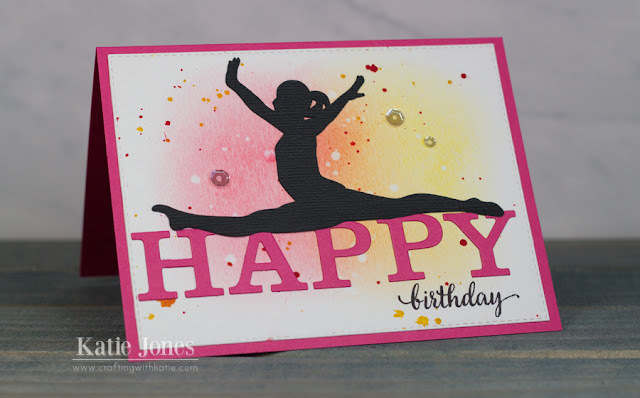 One of my students celebrated her birthday this week, and since she is a competitive gymnast, I thought this cut from the Silhouette Design Store would be perfect for her card! I placed the gymnast on top of "HAPPY," made with the My Creative Time Uppercase Fun Dies. The "birthday" stamp is from MCT's Happy Everything. My background was inspired by a card I saw made by Laura Bassen. I ink blended Tim Holtz Distress Ink in Festive Berries and Mustard Seed onto watercolor paper and added some water droplets. I also added droplets of those same two colors of ink that I created by mixing a bit of the ink with water. I finished off the card with a few Pretty Pink Posh Sparkling Clear Sequins. So pretty! LOVE the background! Beautiful card! I love the background and silhouette. A clever idea to have her balanced on the happy.